Personalized Sewing Kit, Mirror, Hair Brush in Bulk. Inexpensive, Promotional. Gray or Black. Lowest price in USA and Canada. 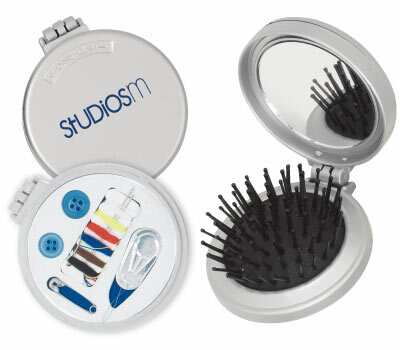 Personalized Sewing Kit, Mirror and Hair Brush on sale. We also supply wholesale blank (not personalized) Sewing Kit, Mirror and Brush for $0.79 each. Budget Prices in USA and Canada for promotional Sewing Kit, Mirror and Brush. American clients pay no taxes. The unit prices below include your 1-color custom imprint on one side of the 3 in 1 Sewing Kit, Mirror and Hair Brush. You may order any quantity above the minimum. We also supply wholesale blank (not personalized) 3 in 1 Sewing Kit, Mirror and Hair Brush for 0.79 each. PRODUCTION TIME : 7 days after art approval; Blank Sewing Kit, Mirror and Brush ships next day. High Impact Plastic with Shatter-Resistant High Quality Mirror. Sewing Kit contains 6 colors of Thread, Needle, Needle Threader, 2 Buttons and a Safety Pin.